Señora Martha Favela and Señora Adriana Rosales together have contributed 66 of these photo essay cooking stories. I take the pictures as they are cooking -- nothing is staged or posed for the camera; if I don't pay attention, I miss the shot. The one concession they both make to me is going light on the hot stuff because my gringo mouth is not up to it. Often quantities are not given because neither does much measuring. Timing is sometimes not reported because they go by look, taste and experience. So these photo essays are not cookbooks, they are visits to a Mexican kitchen. Here's where you can vist the ladies in their kitchens. Along with these kitchen visits, there are some side views of daily family life. Here are a couple of peeks. 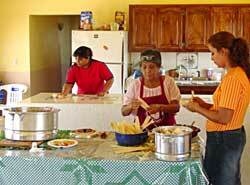 Martha and her daughters are making tamales. Adriana has made these wonderful pork ribs in an orange apricot sauce. Rolly what a great idea. Those pork ribs look yummy. One always wonders despite written instructions if you're doing it right. With all those photos, no more guessing. I'll be referring to this often.